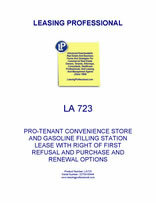 This pro-tenant form is for the lease of a convenience store and gasoline filling station to the tenant. The form grants the tenant a right of first refusal to purchase the property in the event the landlord receives an offer from a third party and wishes to sell during the term. The form also includes renewal options and a separate option to purchase the property in favor of the tenant. Other Features Certain gasoline filling station equipment is included in the lease; Tenant has exclusive right to sell fuel. This Lease (“Lease”) is made as of _________________, by and between COMMERCIAL PROPERTY LANDLORD, INC., a __________________ corporation (“Landlord”), and CONVENIENCE STORE TENANT, a _________________ corporation (“Tenant”). Together with all buildings, structures, fixtures and other improvements constructed thereon as well as, all personal property including but not limited to the certain convenience store equipment and motor fuel sales, storage and dispensing equipment (more particularly described on Exhibit "B" attached hereto) and all and singular the rights, easements and appurtenances pertaining to the foregoing real property and usually had and enjoyed therewith, including but not limited to any right, title and interest of Landlord in and to adjacent streets, alleys, shopping centers, common areas, parking lots, other space or rights-of-way. Section 1.02 Definition. The real property, buildings, rights, easements and appurtenances described in Section 1.01 and Exhibit "A" are hereinafter collectively referred to as the "Leased Premises" and the personal property belonging to Landlord including motor fuel storage and dispensing equipment and convenience store equipment, more particularly described in Exhibit "B" is hereinafter referred to as the "Leased Equipment". The Leased Premises and the Leased Equipment are hereinafter collectively referred to as the "Leased Material". Section 2.01 Length of Term. This Lease shall be for a primary term of ten (10) years, beginning on ___________, 20__ , and ending on ___________, 20__ , subject to the other provisions of this Lease. Section 2.02 Extension Term. If Tenant is not then in default under any provision hereof, the term of this Lease shall be automatically extended for each of three (3) consecutive additional five (5) year terms upon the same terms and conditions contained herein unless Tenant gives Landlord at least ninety (90) days prior written notice of its intent to terminate this Lease at the end of the primary ten-year term or any of the five-year extensions thereof. Section 2.03 Holding Over by Tenant. Except as provided in Section 4.01 B and C, if Tenant remains in possession of any portion of the Leased Premises after the expiration of this Lease as to that portion, or any extension thereof, Tenant shall be deemed to be occupying that portion of the Leased Premises as a Tenant from month-to-month, subject to all of the agreements, covenants and obligations of this Lease insofar as same are applicable to a month-to-month tenancy. A. Leased Premises. As rental for the Leased Premises, Tenant agrees to pay Landlord the sum of $________ for the primary term of this Lease payable in installments of $________ per month, payable without demand or offset, except as expressly provided herein. B. Leased Equipment. As rental for the Leased Equipment, Tenant agrees to pay Landlord the sum of $_______ for the primary term of this Lease payable in installments of $________ per month. C. Proration. All rent for the first or last month shall be prorated on a calendar day basis if the term begins on other than the first of the month. D. Rent for Extension Terms. The monthly rental amount for the first five (5) year extended term, if any, as provided in Section 2.02 hereof shall be 110% of the monthly rental amount set forth in Paragraph A of this Section 3.01. Similarly, the monthly rental amount for each of the two other successive five (5) year extended terms hereof, if any, shall be 115.5% and 121.3% respectively of said rental amount set forth in Paragraph A of this Section 3.01. All other terms and conditions of this Lease shall remain the same for any extension terms. Section 3.02 Terms of Payment of Rent. Rent for the Leased Premises and Leased Equipment shall be payable on or before the first day of each month during the term of this Lease to Landlord at _________________________, Attention: ______________, or at such other place as Landlord may from time to time designate. Section 3.03 Taxes and Utility Charges. Landlord covenants and agrees to provide the facilities necessary to enable Tenant to obtain and enjoy all necessary utilities for the Leased Premises. Tenant agrees to pay as due all ad valorem or real property taxes assessed or levied on the Leased Premises and all personal property taxes on the Leased Equipment located on the Leased Premises during the term hereof except that Tenant may (but shall not be required to) dispute or contest any such assessment or levy in which case the disputed item need not be paid until finally adjudged to be valid. Landlord represents and warrants that all taxes affecting the Leased Premises for periods prior to the term hereof have been paid and Landlord further agrees to provide Tenant with copies of all tax assessments and bills on a timely basis. Tenant agrees to pay all utility charges incurred by Tenant on said premises, including charges for water, gas, heat, light, sewer, waste water, garbage removal and telephone service. Section 3.04 Proration of Charges. Real and personal property taxes, insurance premiums and utility charges assessed or to be assessed for the years in which the term of this Lease shall commence or terminate shall be prorated as of the date of commencement and termination of this Lease. Landlord shall be obligated to pay Tenant promptly for that part of real property tax attributable to the portion of any tax year which is not included in the term of this Lease and which has been paid by Tenant. Section 4.01 Use of Leased Premises. Tenant shall be entitled to use and occupy the Leased Premises during the term of this Lease for any lawful purpose including, but not necessarily limited to, the operating of a drive-in grocery with motor fuel sales facilities, which may include the sale and offering for sale of all the goods, foods, wares and merchandise including alcoholic beverages and tobacco products and the performance of such services as are usually incident to such business. Tenant may at any time during the term of this Lease change the nature of the business operation conducted on the Leased Premises or Tenant may at any time cease business operations in whole or in part, temporarily or permanently, as it may deem necessary or prudent; provided, however, Tenant shall continue to maintain the Leased Premises and shall keep the Leased Premises insured as provided herein. Landlord and Tenant agree to cooperate with each other and to execute any additional documents reasonably necessary to assure Tenant's use and enjoyment of the Leased Premises. A. Exclusive Right to Sell Motor Fuel and Use the Leased Equipment. Landlord hereby grants Tenant the exclusive right to store and sell motor fuels at the Leased Premises. Landlord has heretofore installed or acquired certain motor fuel storage, selling and dispensing equipment on the Leased Premises and Landlord consents to Tenant's exclusive use, occupancy, operation, maintenance, repair, alteration, relocation, removal, disposal, modification, addition to or replacement of such motor fuel equipment being part of the Leased Equipment as defined herein. B. Use of Leased Equipment. Landlord has heretofore installed or acquired the "Leased Equipment". Landlord hereby consents to Tenant's exclusive use, occupancy, operation, maintenance, repair, alteration, relocation, removal, disposal, modification, addition to or replacement of the Leased Equipment including but not limited to the repair or replacement of underground storage tanks, lines, dispensers; leak detectors, pump; hoses, piping, wiring, canopies, kiosks, lights and monitoring devices. The Leased Equipment and any repairs thereto which may be made from time to time during the term of this Lease are and shall continue to be the sole and exclusive property of Landlord subject, however, to Tenant's Purchase Option Rights as Set forth in Subparagraph C of this Section 4.01; provided, however, Tenant may, in its sole discretion and without prior consent of Landlord remove and/or dispose of all or any item of the Leased Equipment and install Tenant's own equipment, apparatus, devices or other assets on the Leased Premises which may be in replacement of or in addition to the Leased Equipment and such replacement or additional equipment of the general type, character or nature of the items set forth on attached Exhibit "C' shall hereinafter be referred to as "Tenant's Capital Equipment" and shall be and remain the sole and exclusive property of Tenant (except in the case in which Tenant fails to cure a default hereunder and Landlord terminates this Lease as a result thereof pursuant to the provisions of Article XII, in which event title to replacement equipment installed inside the convenience store building shall be vested in Landlord subject the provisions of Section 9.01) which may be removed from the Leased Premises upon the expiration or termination of this Lease as provided in Subparagraph D hereof. Notwithstanding the foregoing and Subparagraph A above, it is understood and agreed that any Leased Equipment that is removed or disposed of by Tenant during the term of this Lease shall be replaced by Tenant with comparable equipment which shall be and remain the personal property of Tenant and shall constitute Tenant's Capital Equipment Tenant shall maintain appropriate records of any part or parts of the Leased Equipment that may be removed from the Leased Premises, relocated to another site or otherwise disposed of and shall routinely provide Landlord with notice of the removal and disposal or relocation of any portion of the Leased Equipment and/or make its records of any such equipment removal, disposal, relocation or transfers available to Landlord upon reasonable request.